Richard Bland College of William and Mary has named Andrew Lacey as its head coach of the men’s basketball team. 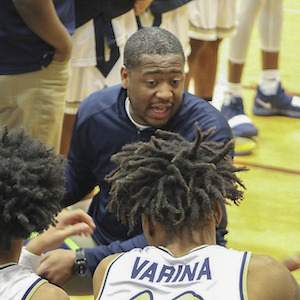 Lacey joins the college after six seasons at Varina High School where he advanced the basketball program, creating a 109-46 record, including a 51-4 mark over the past two years, according to a Richard Bland release. Currently, he serves as head coach with the premier boys AAU program, Team Richmond-Garner Road. Over the last several years, Lacey has coached the 15U and 16U teams and is set to coach the 17U Choice team this summer. Lacey served as both a boys and girls scholastic head coach for 13 seasons, with a 188-101 career record that includes one VHSL Class 5 State Championship, two regional championships and two conference championships. Lacey received a bachelor’s degree in business administration from Bridgewater College, where he was a four-year letterman and served as team captain his senior year.